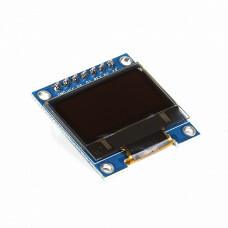 0.96 inch white OLED display module. The display module can be interfaced with any microcontroller using SPI/IIC protocols. It is having a resolution of 128x64 . The package includes display board,display, 6 pin male header presoldered to board. Being a new entry to the market, only limited resources are available on this small piece of miracle (GMS096A). I2C/SPI configuration always demands helpful resources as in any case. For the SPI setup, the module comes in 4 wire SPI configuration by default. For the I2C setup it demands a little bit of work on the module. Actually it was one of our customers who shared these simple configuration steps with us, start with resoldering the resistor from position R3 to R1 and then short the R8 resistor with some solder tin (0 Ohm resistor). The R6 and R7 pullup resistors are already soldered, nothing to do there. Once done, the module is ready for I2C communication! The CS Pin is not necessarily needed, so just connect it to GND. The DC Pin selects the address. For standard address wire it to GND. The RES-pin needs a low pulse at startup and high voltage during operation (as in SPI mode), a 100nF capacitor to GND and a 10k res to VCC would be ideal!